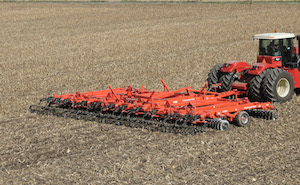 Kuhn Krause revolutionized the vertical-tillage segment with the Excelerator. 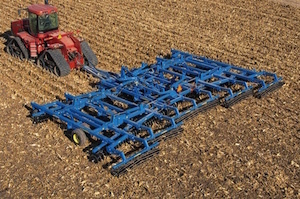 Designed for true vertical-tillage, the Excelerator delivers high-speed residue cutting and soil mixing incorporating many tillage techniques in a single pass. With the exclusive Excalibur blades and Star Wheel treaders, this vertical-tillage system does an excellent job of downsizing clods, leveling soil and anchoring residue, while the 24/7® soil conditioning reel finishes the seedbed preparation. Available in 14- to 50-foot working widths. Introducing our new and improved vertical-tillage tool that still prepares the seedbed, breaks through surface compaction, meets residue management requirements and cuts through tough BT stalks with its SoilRazor™ disc blades: EarthMaster® 3000. The EarthMaster 3000 offers a common-wing design and features heavy-duty walking tandem axles designed to achieve level lifting. Its durable rolling basket design provides a smooth finish, reducing extra trips across the field. It has additional spiders and a thicker wall design in the support tube. For added durability, the tool has a more robust scraper and longer scraper tubes to cover gang junctions in the wing-fold area. The new McFarlane 4100 Series Reel Disk is a true vertical-tillage machine designed to create a superior seedbed without creating yield-robbing horizontal density layers. 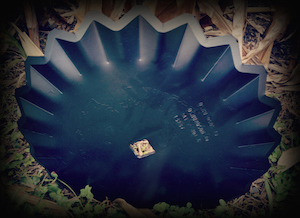 Ultra-shallow, 6-millimeter concave disc blades with easy adjust or optional hydraulic adjust will loosen the top 2-3 inches of soil and slice residue. The new Dura Reel, with flow-through technology and featuring heavy-duty hub and spindle for improved longevity, sizes and mixes the residue. The heavy-duty spike harrow and rolling basket leaves a firm, level seedbed, ensuring accurate seed depth that results in even emergence and better yields. The Reel Disk is available in widths from 12 feet, 3 inches to 45 feet, 8 inches and is designed to operate at speeds of 6-9 mph. Blu-Jet’s LandTracker 9400 is the only multiple use implement caddy that allows you to combine several operations in one pass to save time and money. 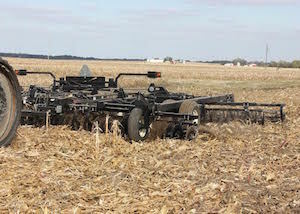 Two independently controlled three-point hitches allow for a multitude of combination passes through the field including strip-tillage, combination tillage and fertilizer application. LandTracker’s 28,000-pound maximum lift capacity and 400 pto maximum tractor horsepower rating means that many of today’s larger implements are not a problem. With the superior flexibility of our exclusive LandTracker 9400, producers can customize it to perfectly fit their operation. The hallmark of LandTracker 940s flexibility is the multitude of tire and wheel lift combinations customers can choose to match their needs. Fertilizer options from ground driven pumps, 1,000-gallon tanks and an ammonia wagon hitch are also available. Do you truly understand true vertical tillage? Great Plains recently launched VerticalTillage.com, an all-new resource devoted to educating farmers on this conservation tillage practice. Explore the many benefits of true vertical tillage, including deeper root growth, improved plant health and increased yields. Additionally, assess soil health, identify true vertical-tillage machines and learn how to implement a true vertical-tillage system. With customer stories, articles, videos and research from multiple ag media sources, you’ll learn everything you need to know about how true vertical tillage can benefit your farming operation. Ingersoll’s SoilRazor discs represent a solid innovation that has quickly spread as the leading standard for worldwide use. 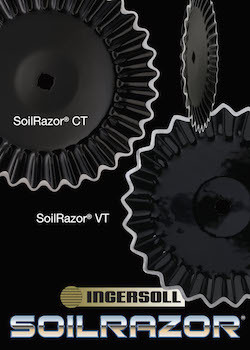 SoilRazor blades are crafted from Ingersoll’s pure professional grade steel, made from virgin iron ore taconite and created with a proprietary formula. These unique properties provide long-lasting performance and durability, and SoilRazor’s innovative saw-tooth edge is ideal for slicing and mixing the toughest residue and for penetrating difficult soil conditions. While they perform, SoilRazor blades maintain their cutting edge throughout their working life, continuing to save fuel, manage residue and prepare the seedbed. See an animated video on the website showing the unique way these blades maintain their cutting ability. 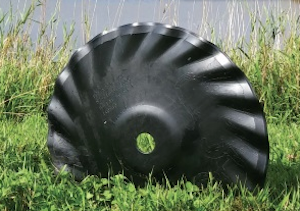 SoilRazor discs are available in two distinct styles as the SoilRazor CT and SoilRazor VT to match preferred tillage practices, and especially well-suited for conservation tillage. AerWay® CCT (Close Coupled Tandem) delivers deep vertical tillage. The offset double roller system, mulches and blends residue with soil. Equipped with ShatterTines®, it vertically vents the soil, shattering and loosens compaction, resulting in a fractured soil profile. 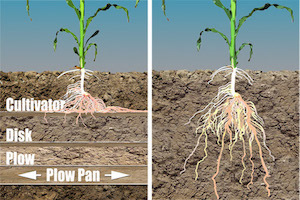 This allows for better moisture retention and movement through the soil profile, improves air movement allowing for faster soil warm-up in the spring and maintains soil structure and dramatically improving tilth. The AerWay CCT is more than a residue management implement, it helps build healthier soils. The CCT has adjustable gang angles for a variety of field conditions, maintenance free bearings and is offered in working widths of 10-40 feet. The difference is versatility©. The Samurai© edge works on high-speed vertical tillage because it uniquely sizes residue back into the soil. Its patented design also stays sharp longer and positively turns with the tractor, which reduces down time and decreases fuel consumption. Size residue faster and easier than ever before with the patented Samurai© edge. The same Osmundson strength, power and quality our customers expect out of our blades can now be harnessed into the most versatile product on the market. Can be used in both plain- and notched-blade applications, is available in diameters up to 26 inches and can be used in all concavities. 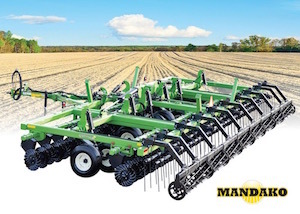 The Mandako Twister is #1 when it comes to versatility in vertical tillage. With the ability to hydraulically adjust the coulter angle from the tractor cab, you choose the finish you want in your field. 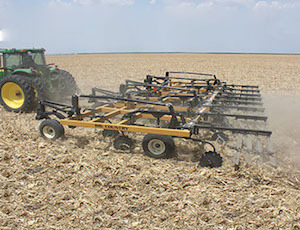 Run the coulters straight for minimum tillage that slices residue and fractures the soil below the blades in preparation for planting. This leaves the residue on top to protect the soil from erosion. “Twist” the blades to run at full angle and you have a tool that will incorporate heavy residue, fertilizer and chemical. At 700 pounds-per-foot, the Twister has the weight to keep the coulters in the ground. 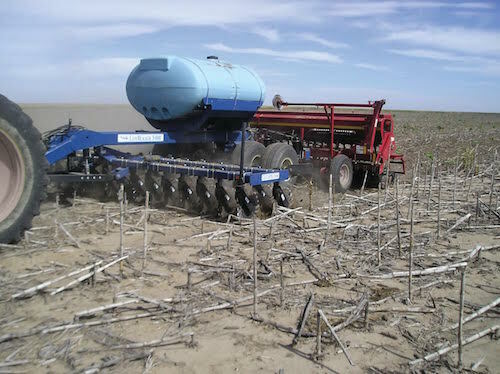 Yetter’s 2982 Vertical Tillage Attachment (VTA) is a multipurpose solution that can be used year-round to incorporate residue and maintain the perfect seedbed. 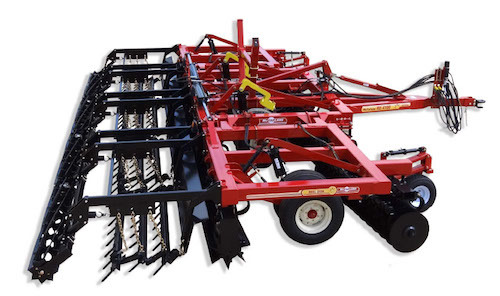 Spaced on 6-inch centers, the VTA coulter blades can be matched to achieve the desired amount of tillage and residue sizing. In the spring, it offers a practical way to dry out and warm wet soils, energizing the seedbed for maximum growth and yield potential. 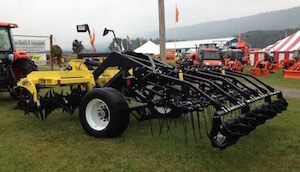 The VTA mounts with a universal bracket to chisel plows, soil finishers and field cultivators, and it can be incorporated with most tillage and NH3 shanks. It can be operated at 6-10 mph. 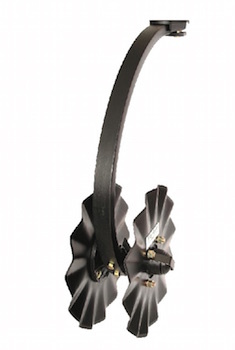 The Turbo Disc Blade design set the standard for vertical-tillage systems. This patented design was utilized in the development of vertical-tillage technology and is the value leader in VT performance. All blades are .256 inches (6.5 millimeters) thick and have a 4.5-inch raised flat center. Made in the USA by Osmundson Manufacturing. For the dealer nearest you, call 800-643-0091. The benefits of vertical tillage and the need for large-acreage productivity have seamlessly come together in three new 7400 Series 5-section Vertical Tillage Plus machines from Landoll. Available in working widths from 39 feet, 9 inches to 49 feet, 9 inches, the 5-section VT Plus can cover up to an impressive 42 acres per hour, while sizing and anchoring residue and mixing a shallow layer of soil — all at speeds up to 8 1/2 mph. When coupled with previous VT Plus models, the Landoll 7400 Series line of vertical-tillage machines becomes the largest in the industry. 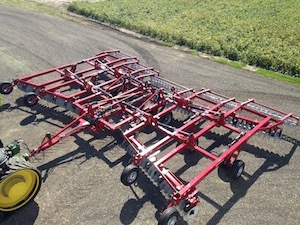 The Big Country Wagon with Wako’s new SM 75 Coulter is spaced at 7 1/2 inches for excellent residue sizing and soil flocculation to allow for earlier planting. Residue is not buried, but remains anchored to the soil surface to promote microbial activity and prevent residue movement during high wind events. This machine can be pulled up to 10 mph. The SM 75 coulter allows for improved water infiltration, seedbed preparation and aeration to enhance grasses. The SM 75 Coulter is designed as a 20-inch notched coulter that’s straight or a 17-inch, 3/4-inch wavy blade. When it comes to Vertical Tillage, Kongskilde’s Model 9100 has proven itself a leader by being able to work in various soil types and many different residue conditions. With the capability of changing the gang angle (0, 4, 8, 12 and 16 degrees) the 9100 achieves primary, minimum and secondary tillage with one machine and one pass. The 9100 uses 20-inch SoilRazor™ blades on 8-inch centers to cut, size and mix the residue with the soil to help with decomposition. For finishing, the 9100 uses a 14-inch, heavy-duty rear roller to create a perfect seedbed. The 9100 is available in sizes 15-43 feet.